This is a follow up post to my varnish over powders post I put up the other day. The comments in that post brought up something I wanted to try out. The idea of using hairspray over powders to keep them from being easily removed. 1. Protect the powders from coming off during use. 2. Do that without altering their final look. At this point, the only thing I've found is the use of alcohol. This does not make the powders permanent, but it does help them stay on the model better when being handled and it does not affect the final look of them. The powders still come off, just not as easily. And I should add that even alcohol will alter powders ever so slightly, but it is the least altering of all the methods I tried so far. What about the use of hairspray? The idea of using hairspray over powders to protect them came up and I figured it would be easy enough for me to try since my house is full of women who do their hair everyday. We definitely have hairspray. I did a few experiments right off the bat with what I found around the house and came up with one type of hairspray that did not seem to alter the powders that much at first. Once I had the kind that seemed to work the best, I set about trying different things with it. Remember the machine piece from the last post? I used alcohol to set the powders in place and I decided to see what the hairspray would do if I sprayed it on the one side left that had nothing else done to it yet. Don't spray the hairspray onto the model. Use it like a wash. Spraying it on there (at least with this kind) is too brutal for the powders. The coat of spray is heavy and the droplets hammer the powder on the surface. This kind of hairspray seems to do well with the darker colored powders and doesn't change them all that much. That's a good thing. Even then, you can see there is some alteration of the powder. Not as much as just applying varnish over the powder, but still some changing. 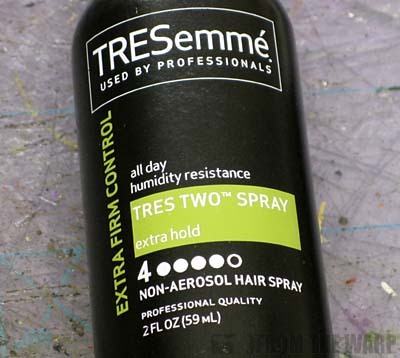 Instead of spraying it for my next examples, I decided to open the bottle of hairspray since it was not an aerosol can and place a few drops on my palette. From there, I used it like I would a wash and allowed it to flow over the surface of the model. And here we have our results for this experiment. Please forgive the photo mismatch, but after applying the hairspray and varnish, I needed to tilt the backpack in order to remove the glare. That makes it appear a shade darker than it really is. NOTE: The backpacks are given the 50/50 paint job of light grey and black. The powder is just one color on each one this time to show the effect over both color basecoats. 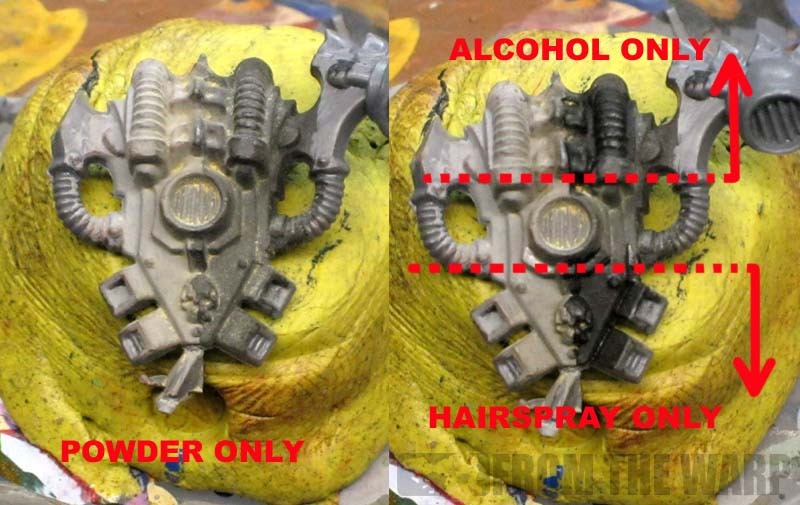 Again, the hairspray was applied directly over the powder with a brush allowing it to flow onto the model. After it dried (with a slightly glossy shine) I gave the whole thing a coat of spray varnish. By flowing the hairspray onto the model, it still goes on a bit heavy. Thinning it might help, but I don't know what I would use, what ratio to try and that's getting into tons of extra work already. The result is that the heaviness of the hairspray tends to eat up some of the finer powder on the surface. You keep the color, but it's a little mottled in appearance. The varnish still darkens the whole thing like expected, but the area that was covered in hairspray does not darken any more when the varnish is applied. The hairspray protects it. Small victory. I decided to grab another backpack, paint it up the same and try a very light powder this time to see what would happen again. The only difference being the light color of the powder. 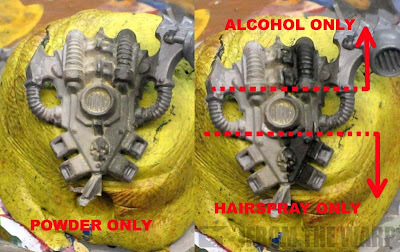 And once more, you can see how the hairspray does alter the look of the powder. More over a dark basecoat. Even alcohol alters the light colored powder as well. There's just no escaping it. Now what? What have we learned with all of this? 1. Powders add a certain dimension to models that can be incredibly difficult to achieve trying to use other methods. They are easy to use, the effect can be amazing... but they have their drawbacks. 2. Trying to protect your powders with anything is going to alter their final look. Depending on what you use to fix/set/seal/protect/whatever, it is going to have an impact on them. 3. Depending on what your base color underneath your powders is and what color powder you have on top will determine the potential shift in the effect. Some combinations just don't do well with trying to preserve them (light colored powder over very dark basecoats). 4. Trying to protect powders will kill the "dusty" look that powders achieve. It is the first thing to go in all the cases. You may be able to keep the color change, but you will lose the dust look every time if you go to add something over them. In the end, I'm going to still keep using powders. I love the look way too much to give up on them just because I can't seal them onto my models. I have word from a friend of mine that he will be showing me the error of my ways when it comes to this kind of thing though. There is supposedly a secret method all the experts use that none of us common hobbyists know about. Looking forward to the secret approach since I suffer from the same problems you have pointed out. Thanks for showing! I am definitely interested as well. 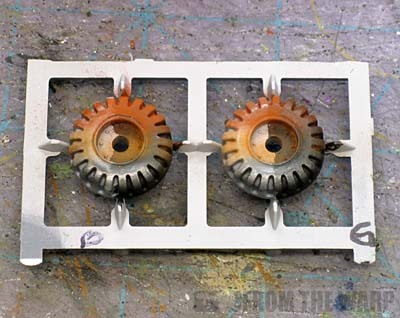 I won a set of MIG powders but haven't used them yet because I haven't found a good way to fix them. I wonder if you could use the same type of artists fix that is used for pastel and charcol works. 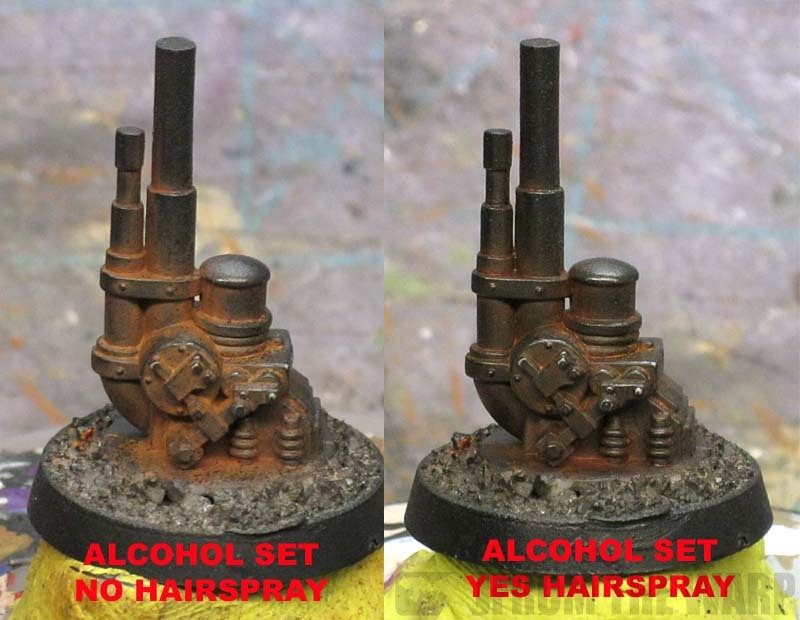 Ron, maybe this was covered elsewhere and I missed it- but have you looked into resolving the powders into alcohol then applying the combination to the model? It allows you see the 'finished' effect while painting you that you can build up the result. It will also help protect the model in the same way as fixing it. I love this series of articles. Thanks for posting. I will be interested in what this friend has to say! I have been wanting to move forward with the powders, but with the inability to seal (I use my models often enough) it's problematic to see the issues and the depth that will be removed. I am hopeful that it will be revolutionary! On a side note, and it will probably be a similar problem, have you tried the Testors Dullcoat? Works really well for me on non-powdered models. Thom: It's called Fixative. I still have the full can on my desk. It too darkens powders considerably if memory serves me correct. DrGabe: Dissolving the powders and applying them similar to a wash is not something I've done just yet. It's another way to apply them, but I can't say for sure. I suspect it's similar to dusting the powder on and flowing the alcohol over it afterwards, but like I said, I still need to try it myself. At best, I bet you get the same properties as using alcohol afterwards. Fayte: I have, it darkens powders considerably and removes the shine from metallic powders (as it should) since it's "Dull Cote." All in all, I'll have another installment in the coming week or so as I get more figured out. Ron, it does somewhat similar to what you are expecting. But its different in one particular way- you essentially get a strong pigmented 'wash' that you can layer on the area in question until you get the result you want. It doesn't give you the 'powdered' effect, but the colors are nice. 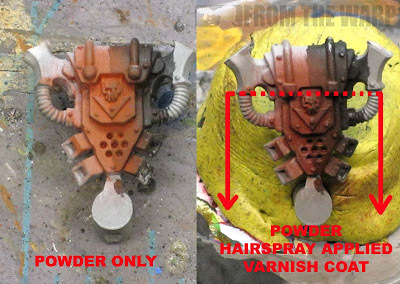 An aerosol hairspray might fix the powders without "hammering" them out of place that the pump hairspray droplets cause. When I was teaching, the aerosol type seemed to disturb the chalk drawings the least and help protect them from smearing. What about sraying the hair spray on before then adding the powders quickly after as the hair spary dry's? I actually like the hairspray fix. I guess it just depends on what the final effect is that you want. I'll definitely be giving it a try thanks for the info! It's expensive to be sure but apparently it works wonders. I haven't seen them so excited since they saw me wearing a vintage t shirt once. I was also going to suggest fixative - but see that there have already been comments posted. Still - interesting post and thank you for sharing the results. You could try reversing the process, spray first then apply the powders while the fixative is still wet.